One-third of the world's food supply depends on bees for pollination. Every year in California alone, honeybees pollinate more than 100 crops worth more than $6 billion, including vegetables, nuts (notably almonds), fruit, and wildflowers. 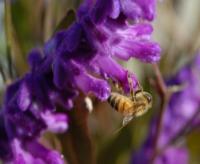 Of the 4,000 bee species in the United States, approximately 1,600 have been recorded in California. 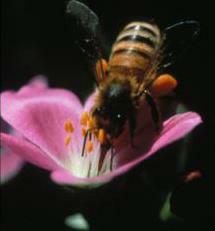 Most are native bees, while some, including the European honeybee, are non-native. Bees are valuable and fascinating. To start, they’re the only insect that produces food we can eat. Without bees, it’s estimated that we’d lose around a third of the world’s food crops and 90 percent of our wild plants. Think how different the world would look without them! Honeybees communicate by performing elaborate “waggle dance” movements, which convey the direction, distance, and quality of food sources. Some of these locations can be up to 500 feet away from the hive. The queen bee lives for up to five years and lays up to 2,000 eggs a day. The entire hive revolves around her, while the worker bees – all female – keep the hive humming by performing all the work. The male bees, or drones, are only there for mating. Once that’s done, they’re booted from the hive. Honeycombs are constructed of perfect hexagons; each angle is 120 degrees. The intriguing and critical existence of bees makes their recent disappearance all the more troubling. Millions of honeybees have disappeared in the past decade, and the reasons for that are multifarious and concerning. Colony Collapse Disorder (CCD) has wiped out a third of the honeybees in the United States since it was first reported in 2004. CCD is the phenomenon in which the worker bees from a honeybee beehive or colony suddenly disappear. According to University of California scientists, the likely cause is a combination of environmental and biological factors, but nothing definitive has been proven. Although CCD has abated somewhat in the past few years, it is still causing losses up to 45 percent every year. Numerous other factors threaten honeybee populations, including the stress induced by long-distance hauling of bee colonies from crop to crop across the country (an average of 5,500 miles a year), climate change, the artificial insemination of queens, loss of habitat, and a lack of genetic diversity. All of these factors have the potential to upset the balance within the hive and result in diminished immunity of bees to pathogens. 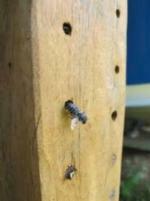 Another serious bee enemy is a particular mite, aptly named Varroa destructor. These insects feed on the blood of adult and developing honeybees, thereby transmitting pathogens and suppressing bee immunity. Honeybees also suffer when exposed to viruses, bacterial diseases, and fungi. For instance, Deformed Wing Virus prevents bees from foraging for food and doing the necessary work to keep the hive alive. Pesticides may also negatively affect the health and population of honeybees, as the recent studies on the nicotine-derived neonicotinoid insecticides purport, and there is only rudimentary understanding of the impact of pesticide combinations. While studies do show a relationship between bee decline and neonicotinoids, especially on wild bees and bumblebees, the impact on European honeybees is insignificant when compared to the profound effect of other beekeeping practices such as trucking hives long distances, a lack of diversity in pollen and nectar sources, and the use of fungicides. How can home gardeners help? Fill your garden with at least 10 species of flowering plants that provide nectar and pollen. There are many excellent suggestions, including the UC Berkeley Urban Bee Lab plant list, and the UC Davis Häagen-Dazs Honeybee Haven plant list. Aim for a combination of plants that provide year-round bloom and a mix of flower shapes, sizes, and colors. In particular, include blue, violet, and yellow flowers. Leave some bare soil for ground-nesting bees, and consider providing nesting blocks and/or bundles of hollow sticks. Provide a shallow water source where bees can get a drink.